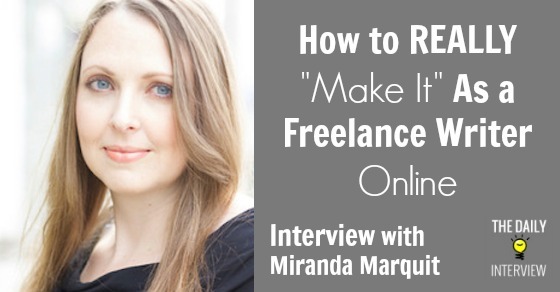 Through all the freelance writers we’ve interviewed on The Daily Interview, Miranda Marquit is one of my favorite guests. Not only does she have great writing experience, but she really has a firm understanding of how to be successful as a freelance writer. Even better (for us), she’s done a great job of conveying those tips and strategies in today’s interview. In addition to talking about how she got started in this industry, she offers some incredibly valuable advice about how she can command a high rate when writing for clients (and how you can too), and how she goes about marketing and promoting her services. There’s a lot of good stuff here. Be sure to take it all in! 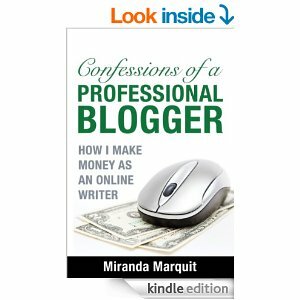 Miranda, you’ve had a quite a bit of experience and success as a freelance writer and blogger online, and I’d love to learn more about your business. Tell us a bit about your background and career as a writer. When did you first begin writing online? What types of writing projects do you work with, and how has your writing business evolved over the years? I’ve always enjoyed writing, but never thought of it as a career until I worked at a newspaper. I graduated with a Communications degree, and went to work at a newspaper on the advertising side. Soon I discovered that I liked the writing side better than the advertising side, so I earned my M.A. in Journalism at Syracuse University. I knew I wanted to be a freelancer and work from home, so after I graduated in 2005, I immediately began writing online. I initially started out as a science writer, since I was a Physics major at one point, and I enjoy science topics. I wrote for a physics web site, interviewing scientists and university researchers on the verge of breakthroughs. I also landed a few small gigs using contacts from Syracuse, like writing for Discover magazine. Mostly, though, I wrote for content farms and completed keyword articles for peanuts. It was mostly about volume. I did as much as I could. In those days, you could write a 250 to 300 word article, and it didn’t have to be particularly high quality, and it would do great in the search engines. I wrote about everything from window treatments to weddings to money. Some of it required research, but much of it didn’t. I carefully chose high-quality pieces to share with others, as portfolio pieces. I also spent time applying for gigs online. I was asked to start writing about money, so I did. I got involved in the personal finance community, sharing on Twitter and on niche sites like the now-defunct Tip’d. Soon, others who saw my work through these sites started asking me to write for them. That led to other opportunities to provide content, including ghostwriting financial books. Most of my client work involves providing content to blogs and web sites, and ghostwriting books. I also write press releases and content for web pages. Since I started, things have changed a lot, especially as Google has tweaked its algorithm. There’s a greater demand for research and interviews, and longer, higher-quality pieces. I’ve enjoyed getting back to more journalism-style writing in the last couple of years. What do you consider to be your greatest success (or successes) so far in your career as a writer online? My greatest success is that I can provide for my family doing something I enjoy — and doing it on my own terms. I can’t really speak to traffic, since most of what I write is published on sites owned by others. However, it’s fun to watch when something I’ve written is picked up by MSN or Lifehacker, or linked to from the Wall Street Journal. And, even though my name isn’t on a lot of what’s floating around out there, I do kind of feel it a success when something I’ve ghostwritten appears on a major site with heavy praise. Between writing for yourself (on your own websites), to writing for other blogs, and even writing eBooks to sell, what’s your favorite type of writing project and why? A mix of these writing projects is probably ideal, but what do you feel like is the most viable path for someone who wants to make a living writing? Finding a balance is difficult. If you want to make a living, practically speaking, you need to either have a “real” job that can support you until you make it, or you need to have a solid client base. I did things backward with my business. I started writing for others, and only added my own blogs later. Today, though, I recommend that aspiring freelancers start their own blog immediately, in order to have a “home” on the web and to provide portfolio pieces as they build their own sites. But it can be challenging to make a living as a writer off your own projects until you’ve built a reputation. Working for others — at least at first — provides you with an income that can be a little steadier, and you know you’ll get paid. Sometimes, it’s difficult for me to take the time to work on my own blogs because I know I might not be paid for the effort, at least for a little while. However, I’ve been able to cut back on client work as my own endeavors have started yielding fruit. My favorite project, though, was writing my book. I’d written other books in the past, but they were others’ projects. Doing my own book was great. It’s available as an eBook, but also on Amazon for the Kindle and as a paperback. One of the things I’ve learned from working on three different books is that if you want to do a book, self-publishing is the way to go. But, even so, you should work with knowledgeable professionals for design and formatting. I’d say to start out, if you can, with 70% to 80% client work, bringing in income, and then working on your own projects on the side. As you start to build your reputation you can begin devoting more time and effort to your own projects. This is the practical way to go, offering you the quickest path to a freelance career that doesn’t require you to work a more traditional job at the same time. What was the turning point from when you went from “writing for peanuts”, to commanding a higher rate that eventually allowed you to work on your own terms and earn a six-figure income? I’m sure it’s a very gradual process, but what’s the best approach you’d recommend for a new writer to move as quickly as possible away from writing at low rates? First of all, you need to know your worth, and you need to deliver on quality. Anyone can dash off a low-quality, general, 400-600 word article for $5 to $10. Part of what you need to do is offer better quality. You can also offer something a little different. I charge a premium for articles that include research and primary sources/interviews. I also write authoritatively, and try to back up what I write with expert views or research for clients willing to pay more. Another way to find out how much you can charge is to raise rates on new clients. I got this advice from a good friend who asked why I was still writing so much for so little. Quote a higher rate on subsequent clients until you reach the point at which someone says no. This will give you an idea of what you can charge, and it can be a way to quickly boost your rate. However, there is no substitute for a good reputation, and there is no substitute for doing good work. Good work often speaks for itself, but I know marketing still plays an important role as well. What have been your most successful strategies that have helped grow your business (and portfolio)? Networking is my most successful strategy. I network online, and I attend conferences to network offline. Online, I engage with others on social media, especially Twitter and LinkedIn. Making connections with other blog owners, and with media contacts, can help you find work later. It can also be a good way to find sources for your stories. I also find that networking in person can help. There’s something about meeting someone face-to-face and making that connection. I usually come away from the Financial Blogger Conference with a few new gigs, and I leave NMX with two or three gigs. And I have several more leads and possibilities when I come back from these conferences. Even though it’s hard work for me (I’m an introvert with mild ADD) to connect with others and network, it’s worth the effort because it’s one of the best ways to get gigs. This networking has also led to word-of-mouth, where connections of connections have been referred to me. Looking generally at becoming a freelance writer: If you had to take your best advice or inspirational thought and put it into one sentence or phrase, what would that be? My favorite resources for gigs are Media Bistro, FreelanceWritingGigs.com, Problogger, and Contently. I’m not a fan of freelance bidding sites, though. They can be a source of work, but you generally end up lowballing yourself. I also like the Freelance Writers Den, which has a waiting list and a membership fee. But it’s a solid resource. When it comes to the fundamentals, you can’t beat the AP Stylebook, which is online now, and a must for anyone who wants to write like a journalist. Purdue’s Online Writing Lab, which offers hints on various writing styles, is also a great resource. And, while it’s not exactly an online resource, The Elements of Style is available on Kindle and a good place for any writer to start. My personal finance blog is Planting Money Seeds, and my blog about freelancing and writing is at MirandaMarquit.com. Find me on: Google Plus, Twitter, Facebook, LinkedIn, and Pinterest. You can buy my book, Confessions of a Professional Blogger, on Amazon or through my web site. Thanks so much for your time today, Miranda! What did you think about this interview with Miranda? Have you used some of these strategies to become a more successful freelance writer? Leave a comment below!